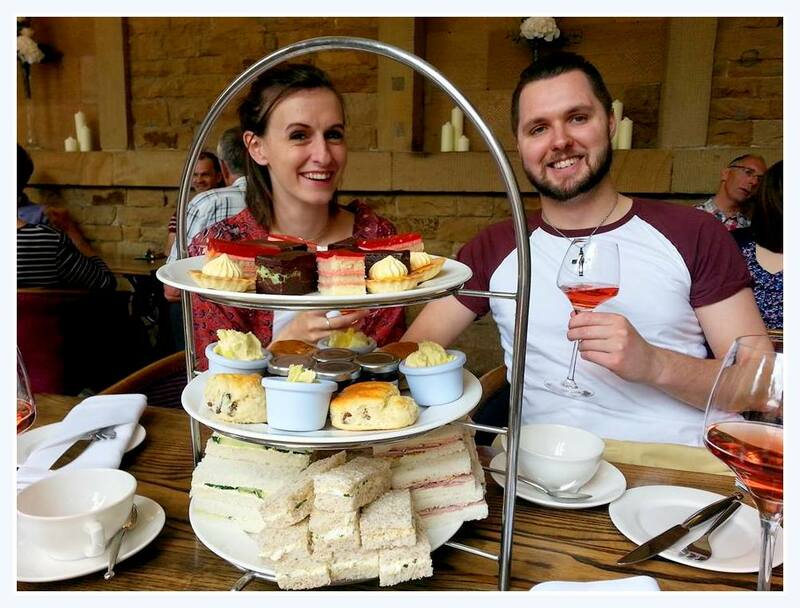 Afternoon Tea at Chatsworth House, Derbyshire. So last month Jordan's mum and partner paid us a visit from Northern Ireland, I was really looking forward to spending time with them and Jordan over their weekend stay but due to working (as always!) I was just happy that we had Saturday together to pay a visit to Chatsworth House in Derbyshire. Some facts about Chatsworth House for you, the house was built between 1687 and 1707. There is three floors containing incredible displays of art, furniture, sculptures and paintings housed in ornately decorated rooms. There is as much to see inside as there is outside, with a thousand acres of gardens containing so much vibrant colours and beauty. The Chatsworth House also appeared in the 2005 film adaptation of Jane Austen's Pride and Prejudice, representing Pemberley, Mr Darcy's house. Our first pit stop when arriving at Chatsworth House was into the Cavendish Restaurant for a spot of Afternoon Tea, the selection of sandwiches and cakes were an absolute delight and we even had a nice glass of rose wine to start out day. The setting in the restaurant was beautiful, really light and airy making for a pleasant dining experience. The restaurant is set in old 18th century stables and offers a menu which compromises both British and European dishes on offer. We then decided to start walking around the corridors and floors throughout the building of Chatsworth House. The building itself sits so beautifully and proudly surrounded by the acres of green, it included so much variety within the walls that it made for interesting eyesight and discovery. I was drawn to the beauty of the paintings placed on the walls or on the ceilings around each corner really emphasising the atmosphere generated in the building. There was a lot to take in throughout the building that it became overwhelming and found it hard to digest everything that Chatsworth House had to offer to the public. We then made our way around the acres of beautiful gardens, full of flowers and various lakes that would make any Alan Titchmarsh overwhelmed. It was absolutely gorgeous, it even included a maze which of course me and Jordan had to have a go at (and just to let you know cause I know you'd be dying to yes we did many to succeed!) It was really nice and relaxing to walk amongst something that was so scenic and beautiful. I really enjoyed smelling the roses and having something beautiful greet me at every corner. I would definitely recommend anybody to pay a visit to Chatsworth House in Derbyshire, it's beautifully presented and has lots of gorgeous elements to offer to you. You can find out more about it right here on their official website. The afternoon tea looks amazing! And the pictures you took are really nice...it looks like a lovely place which I really want to go and visit now! Chatsworth House is so lovely isn't it! I would love to try the afternoon tea next time I go. (good timing for this comment laura!) yes definitely do it's a bit on the pricey side but it's definitely worth it! This looks so fabulously british and fabulous!!! !